Set amongst coconut palms and tropical plants, Tarisa Resort and Spa epitomizes local charm and style. Tarisa Resort & Spa has direct access to one of the most popular and sandy beaches of the island, with its magnificent azure shaded lagoon. A true tropical island paradise, the Resort has the key ingredients for a superb exotic holiday. 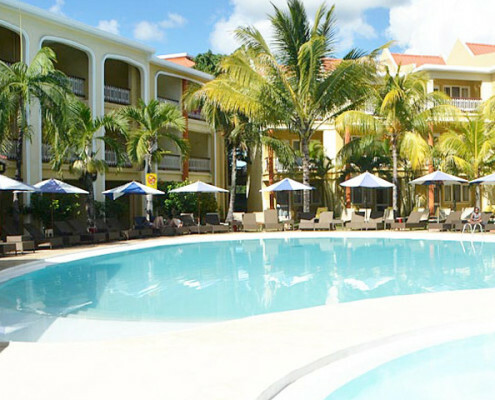 Delightful accommodation and a relaxed, friendly ambiance, combined with the legendary Mauritian warmth spell for an unforgettable stay with family or friends at this charming resort. 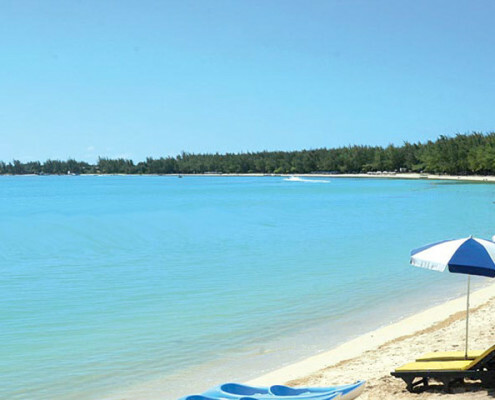 Located on the north coast of Mauritius, in the charming village of Mont Choisy, Tarisa Resort & Spa is only 5 minutes away from the activities and nightlife of Grand Baie. 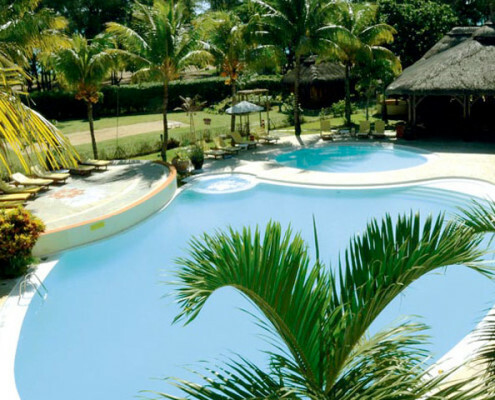 The Resort is approximately an hour from the airport and 30 minutes from Port Louis, the capital. Elegant and spacious, the Superior rooms, including Family rooms, and Suite have been designed to provide optimal comfort. The warm colours and local-styled décor create a charming mood and relaxed atmosphere. All room styles have a private terrace or balcony. The Superior rooms are equipped with a bathroom and shower cabin and the Family rooms have 2 separate bedrooms include a queen size bed as well as 2 single beds and a bathroom with bathtub. 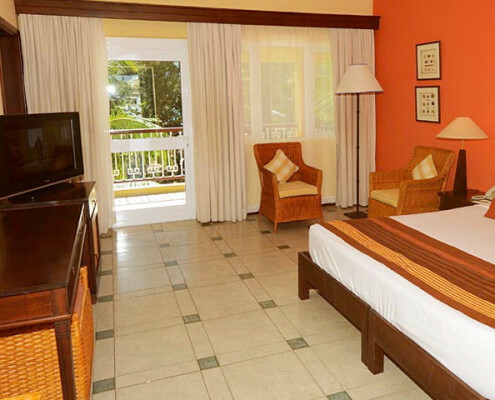 Our Suite has a queen size bed, lounge area and a bathroom with bathtub. Most rooms have a view of the pool and beach or the garden and all feature air conditioning, mini-fridge, satellite TV, IDD telephone, hairdryer, room safe and tea/coffee making facilities. Our restaurants offer a wide selection of international and Mauritian cuisine as well as the gastronomic delights of India. Set besides the swimming pool with a splendid view of the beach, the Indigo Restaurant will tempt you with a variety of Mauritian culinary delights and offer you both local and theme cuisine with a selection of exotic and tasty dishes. Open every day for breakfast, lunch and dinner. On the first level, the doors of the Tandoor Restaurant open on a lavishly decorated dining hall. The elegant oriental décor and mystical atmosphere of the restaurant set the mood for a journey into the exotic flavours and aromas of Indian gastronomy. Guests are presented with a menu featuring a selection of refined dishes, prepared in the authentic tradition of North Indian cuisine. The Tandoor is open for dinner most nights of the week. 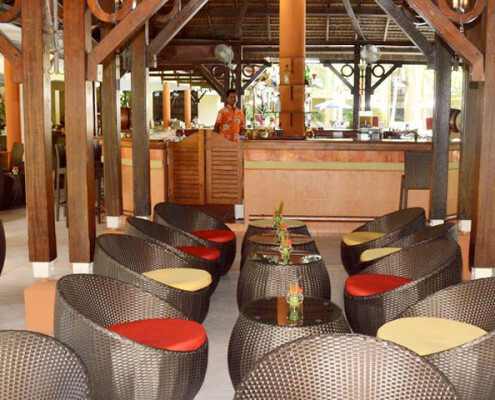 Overlooking the swimming pool and the spectacular Mont Choisy beach, the Citrus Bar is the place to be for a drink with friends or an aperitif before dinner. Open every day from mid-morning till late, the bar offers a wide choice of drinks and cocktails. Swimming pool, swimming pool for kids, Scuba diving, big game fishing, windsurfing, Pedalo, Kayak, Laser boat, glass bottom boat, Aqua Gym, snorkelling, beach volleyball, golf, mini golf, French bowling (bocce-ball), horse riding, scooter and bike rental, water polo, tennis, table tennis, water skiing, parasailing and submarine dive. To liven up your nights, the daily entertainment program includes live music, Karaoke or cabaret shows every evening. Once a week, the Sega show will entice you to dance the Sega, the dance of Mauritius, to the rhythmic beat of local music. Our mini-club is available for children aged 4 to 11 years old. A baby sitting service is available on request. Dedicated to beauty as well as the harmony of the body and soul, the Spa comprises massage cabins, a shower cabin, Hammam, Sauna, hairdressing and beautician facilities offering a range of body and beauty treatments and massages. Pamper yourself and enjoy a reviving spa day in the expert hands of our dedicated personnel. A fitness centre is available for you to keep in shape so why not follow your workout sessions with a steam bath in our Hammam or enjoy a relaxing time in the sauna. 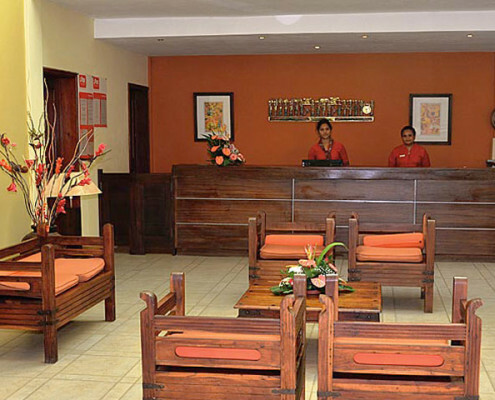 Resort facilities also include a boutique, car rental, taxi service, laundry service, postal service, foreign exchange and 24 hour medical assistance. A conference room is available to our business clientele for meetings and conferences.